Class of 2020 guard Adam Miller has been making a name for himself on the national level the last 6-12 months. 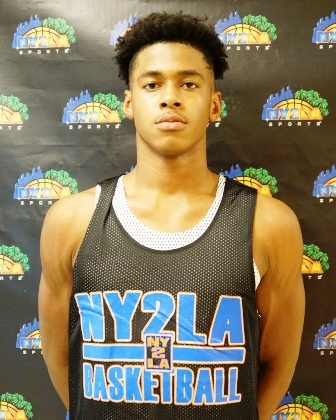 After earning Co-MVP honors at the annual NY2LA Sports Future Camp Miller has carried his success over to the high school season. After transferring from Peoria Manuel to power Morgan Park Miller has been able to continue his high-level play averaging 24 points, 8 assists, and 6 rebounds over the last month for one of the state's top programs. Playing alongside one of the top 2018 guards in the country in Illinois bound Ayo Dosunmu, Miller has had to take on a different role then what he is use too. That hasn’t stopped the top 2020 prospect in Illinois from making noise and putting up numbers. Being a 6-3 lefty guard that has been shooting the lights out this season, Miller is a match up nightmare for opposing teams. Miller excels at pushing the ball and playing in a high tempo style of play using his scoring and passing skills. He is able to create his own space and knock down jumpers but can also shoot off the catch at an extremely high level. Top programs from across the country have taken notice of the talented top 25 national guard (i.e. currently ranked #10 on the NY2LASPORTS.COM Class of 2020 National Player Rankings). Miller already holds offers from the likes of Kansas, Illinois, Memphis, Oklahoma State, UCLA, Wake Forest, amongst others. With no visits scheduled at this time Millers main focus is on winning a city and state championship with his Morgan Park team. Having an extremely tough route to winning the championship many believe if this Morgan Park team is healthy and focused they have the ability to make a ton of noise these next two months and potentially win it all. Miller plays with the Mac Irvin Fire during the traveling grassroots season.